There are a number of Zero fighters that can be seen throughout the Pacific. In Palau, there is a Zero and there is one in Gizo. In Chuuk Lagoon there is a Zero fighter that can be seen only a few metres from the end of the former airstrip on Eten Island. This Zero appears to have suffered a terminal engine failure on take off (there is no obvious bullet damage but I may be wrong) and is lying upside down in 10 metres of water. The plane is fully intact except where it has broken in two a metre behind the wings. The wheels are missing, the doors open. The propeller is not bent indicating that the engine was probably dead when the plane hit the water. 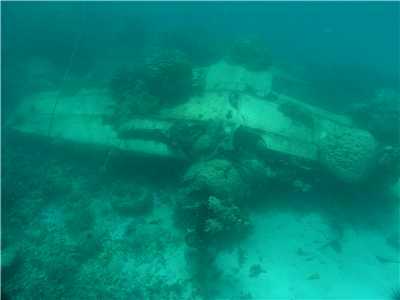 This plane is usually snorkelled by divers while having their lunch on Eten Island although some use the remains of the air from their previous dive. A nice distraction from lunch. There is apparently another in Chuuk Lagoon at the other end of Eten Island but it is in very shallow water. There are also pieces of Zeros in Hold 2 of the Fujikawa Maru.